By Kori ~ July 5th, 2012. Would you like a quick suggestion for a good wine to drink tonight (or this weekend) that wonâ€™t break your budget and is widely available? Many of our readers have said this is something they would like, so here is this weekâ€™s selection, the 2011 Julietteâ€™s Dazzle RosÃ© from the Horse Heaven Hills of Washington State. 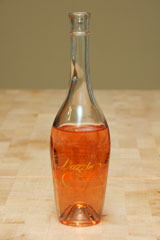 Julietteâ€™s Dazzle RosÃ© is produced and bottled under the Dolan & Weiss Cellars label. However, the masterminds behind it are Long Shadowsâ€™ founder Allen Shoup and winemaker Gilles Nicault. For years, Gilles has made a dry rosÃ© for Allen to enjoy and share with his own family and friends. After numerous requests from guests at Allenâ€™s dinner parties, in 2011, he asked Gilles to set aside a special block of grapes at The Benches Vineyard to allow for increased production. I have a sister in Boise, Idaho who has fallen in love with this wine so please let me know how she may purchase more! Glad to hear that your sister enjoys Juliette’s Dazzle. Here’s a link to some online retailers who carry it: http://www.wine-searcher.com/find/juliette%27s+dazzle+rose/2011. Otherwise, she might want to contact Dane Narbaitz at Long Shadows (425-454-3918, dane@longshadows.com) to find out who might carry it in Boise. Cheers!